To buy our oil you have only to send a simply form. Otherwise if you are trader and you want to send our olive oil write us and we contact you as soon as possible. It is obtained from olives of Gentile di Chieti e Leccino cultivar. Its colour is yellow with highly attractive green glint, then comes the flavour that is herbaceous, fruity, intense with some hints of bitterness and pepperiness. It is perfect as raw condiment, you can use it on soups, salads, vegetables, fish, grilled meat, but it is also delicious if you taste it on grilled bread, it is an extravirgin olive oil suitable for any cooking. It is obtained from olives of Gentile di Chieti cultivar milling and flavored with lemons or orange of Costa dei Trabocchi. Lemon oil is ideal for dressing on grilled fish and meat, but it is also delicious on fresh salads. 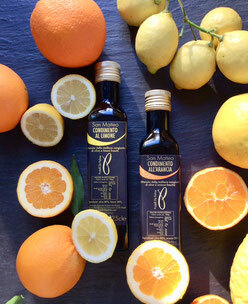 Orange oil is ideal for dressing on fish hors d'oeuvre,shellfish, roast lean meat, game, white meat, but it is also delicious on every kind of salads. 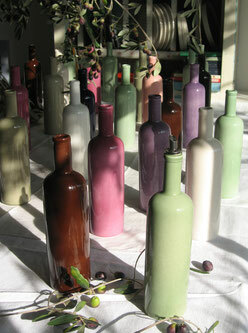 This olive oil bottle is designed by Maria Vera Chiari, a famous Italian designer. Available in many different colours. 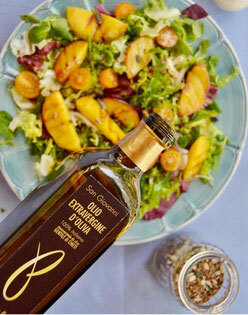 The extra virgin olive oil is obtained from olives of Gentile di Chieti e Leccino cultivar.